POP Tennis, go to www.poptennis.com to find out more info! The NEW 38mm 100% Carbon Fiber with 3x the mesh will be here soon! the manufacturer of the premier wood paddle for the game of paddle tennis. Hi-I'm Brian Lee and I make the Powerpaddle. Over 30 years ago, the family business was started by my dad, Walt Lee, a carpenter who played paddle tennis and had an idea that he could make something a lot better than the current paddles on the market. That idea and the results of many paddle "experiments" in Dad's garage, combined with his fanatical love of the game were the start of the Powerpaddle business. 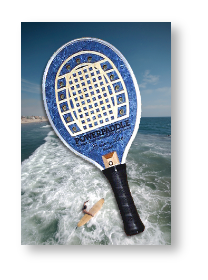 I became involved in Powerpaddle after college (tennis scholarship) Dad got me going in the game of paddle tennis, and I jumped in with both feet, playing it enough to become a five-time national champion and longtime teacher in the Southern California area. When my dad passed away (right after hitting a winner for match point at court 11 at Venice Beach) I took over the business in 1988 and have sold almost 80,000 paddles worldwide so far, making Powerpaddle the top selling paddle in the U.S.! I still handmake our wooden wonder with the finest quality materials available, in our Venice, California shop, just down the street from the beach courts where I still play to this day. There are a lot of composite paddles available today but we still believe in good old sustainable wood. Old-school definitely. But the solid hit and exceptional control you get from our sharp, deep waffle-cut paddle is something you really have to experience, if you are used to the composites/graphite. And once you see for yourself the amazing topspin and underspin control Powerpaddle provides, you'll be hooked for life! 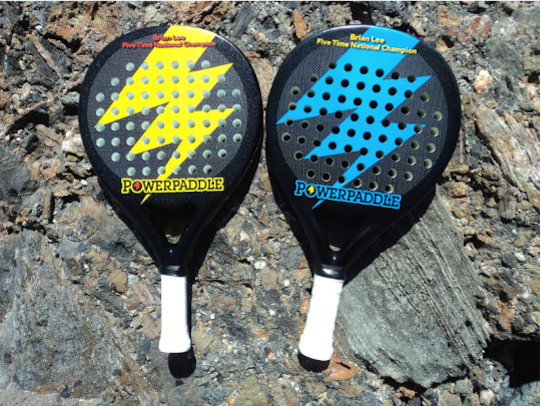 So maybe it's time to power up your paddle tennis game, play with the Powerpaddle.